On Monday, I talked about graphic novels (or comics) in general, shared a little of my own history with the medium, and told you about a good book that covers the basics of comics. Today, I want to say a few words about types of graphic books and how they're published and then talk a little bit about reviewing. Tomorrow I'll give you an annotated list of GNs I've already read, am reading, or want to read. First, before the people who know way more than I do about graphic books get all bent out of shape, I should say a little something about the terms I use. Experts in the medium make a distinction between illustrated books, graphic novels (and nonfiction), comics, and so on. Not only am I aware of the difference among these types of graphic books but I understand the importance of having clear terminology. For the sake of my Graphically Reading posts, however, I use the term GN (for graphic novel) to mean pretty much all these, fiction or not. This is just to make it easy on myself when I'm writing about the story form in general. Publication crazies. Normally when you buy a novel, you have three choices: print, eBook, or audio. But no matter what the medium, you are still buying the same book, from page one to the end. Simple and familiar. When buying a GN, however, you are faced with other options. 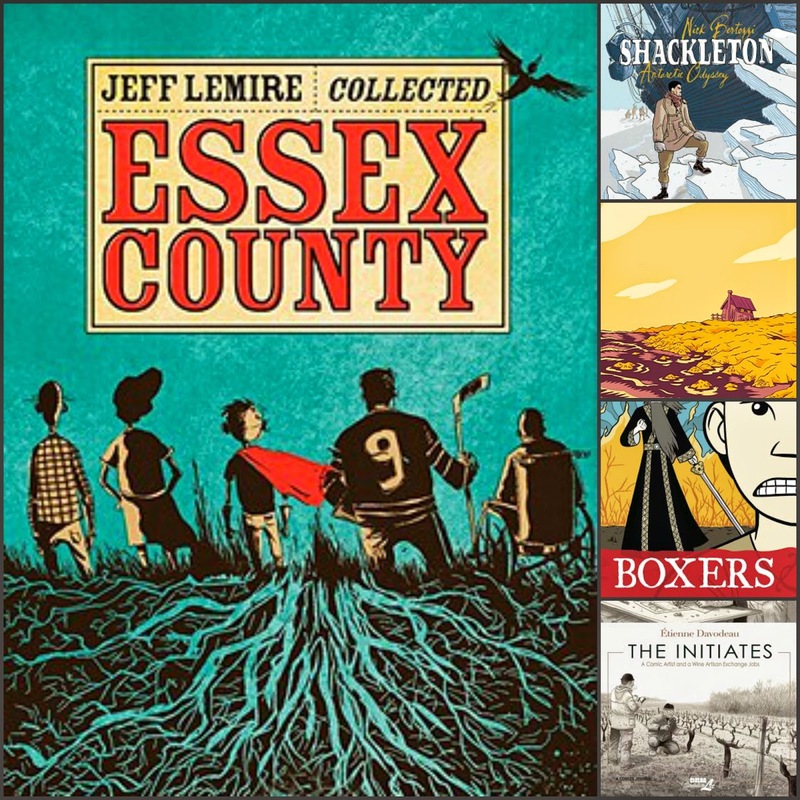 Of course, some GNs are stand-alone books (Sailor Twain) and some are parts of a short series that have been bound or boxed together (the Essex County trilogy, Boxers & Saints), just like a "regular" book. Buying GNs gets trickier, however, when you start to get involved with longer series. Many of these are first published as individual issues (Sweet Tooth, Saga), which are later republished in bound collections. In addition, some very long series (Northlanders) are available in bound story arcs. So you have the choice of reading issue by issue or by collected volumes, either chronologically or by plot. And just to make it crazier, some comic artists give their readers bonus issues (called one-shots), which usually focus on a side story or a particular character. If you are unsure of how to read a long and complex series, like Fables, you can opt to read them in the order they were published or you can do a little research or ask friends about the best way to approach the books. For more linear series, you can choose to read each individual issue as it comes out or wait for a bound volume. These are matters of personal taste and economics. Reviewing. I have been a bit lax with reviewing GNs lately. It's easy enough to review a stand-alone book, and I'm fairly caught up in that department. My real problems come with the series and stem from two places. First, some of the series I'm reading are really, really long. Let's face it, even though the characters grow and change and they find themselves in new situations, what more can I say about Fables seventeen that I didn't already say about the first sixteen volumes? Instead of writing about each installment, my new approach is to wait until either I finish the series or I reach a logical pause in the overall plot line. The second problem occurs when I read a series issue by issue, as I'm doing for Sweet Tooth. So for those GNs, do I review each twenty-page issue as I finish it? Do I wait until I've read the issues collected in, say, the first bound volume? Or do I review the series when I think a story arc has ended? I haven't fully decided on my approach, except that I will not be reviewing each individual short issue. Finally, I'd like to encourage those of you who review GNs to remember to comment on the medium itself. Because the heart of a GN is the interplay between art and words, don't just concentrate on the plot, tell us a little something about the pictures and how they affected your connection to the characters, action, and setting. 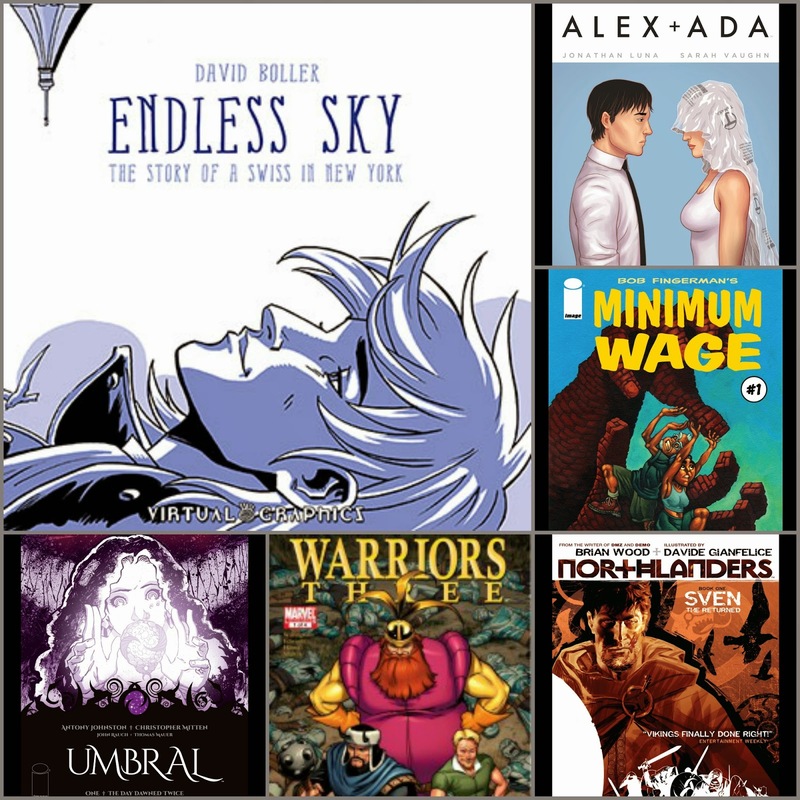 Tomorrow look for my current GN reading list. You'll find series and stand-alones, fiction and nonfiction. I'm reading adventure, historical fiction, dystopian, memoir, and mystery. Some of the GNs are in full color, others are monotone; some are read left to right, and others right to left. Hope you find something that calls to you. I hear you on the reviewing. I'm OK reviewing them separately when there are like...three in the set. But the series get laborious. And I'm sure I've screwed up on the terminology because I am a casual reader of GNs. Not even sure I know the difference, honestly. I just know when I like them. I find it amazing how many different types there are...from super heroes, to non-fiction, to memoirs. I find reviewing any series difficult after a while - it just feels like you're saying the same old thing. I think it's sort of like children's picture books in a way - the art plays a huge role and is really important to evaluate. I have found a couple stand alone traffic novels that I have enjoyed but for the most part they are not go to books for me. I think they are beautifully done though! My daughter and son in law used to collect first edition comics, but I don't know the difference between a comic book and a graphic novel and manga. I need to read your past posts on this subject. 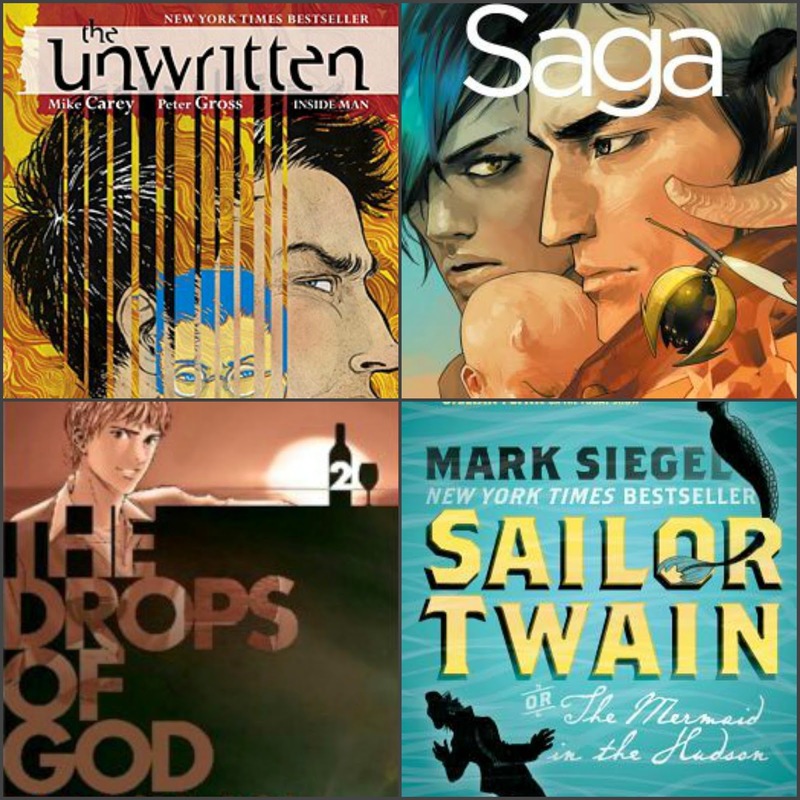 Just asking an opinion to those who read them, do you also read a graphic novel based on a book you have read already? I think my granddaughter read the graphic novel of Twilight, but has also read the book, so it must offer something extra to do a reread so soon--thanks! Great last point--it's almost like reviewing an audiobook and not mentioning the narration/production (something that drives me batty!). I haven't dipped into the series GNs yet mostly because I'm intimidated in all the different issues and volumes! I have my eye on several but part of me wants to wait until they've all been published before I dive in. I appreciate these posts! Though I would love to know the difference between comic and graphic novel. Some sources I've seen have basically said there isn't a difference (which I don't think I buy).